It is a rare, colourless, tasteless and chemically unreactive gas. A Xenon In a vaccume tube (gas filled tube), produce blue glow light when excited by electrical discharge. A Xenon is available in sealed glass containers of gas at standard pressure. Xenon is used in electron tubes, photographic flash lamps, stroboscopic lamps and bactericidal lamps used in food preparation and processing, High-pressure arc lamps to product UV light (solar simulators) and high-intensity arc-lamps (Projection lamps) for motion picture projection. It is also used in lamps used to excite ruby lasers that generate coherent light. 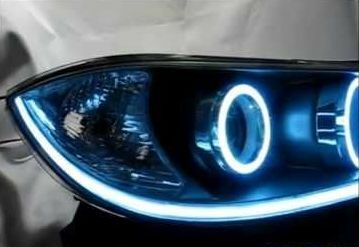 Other uses are as a Xenon ‘blue’ fog lights and head lights in some vehicles. Used in Medical as a General anesthetic or General anesthesia (A machine that can deliver xenon), in Sports Doping (Xenon inhalaled athletes has been failed in sports Doping test) and Neuroprotectant. It is used in the nuclear energy studies(atomic energy field) in bubble chambers, probes, and other applications where a high molecular weight and inert chemistry is desirable. The perxenates (Salts of the yellow xenon-containing anion XeO64-) are used in analytical chemistry as oxidizing agents. 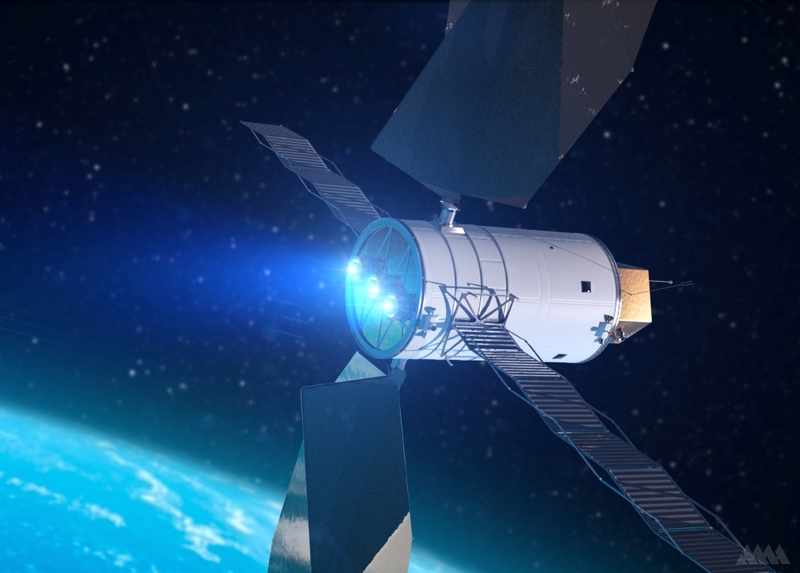 Xenon ion propulsion system (XIPS) are used by several satellites to keep them in orbit, and in some other spacecraft, Because it is easily ionized and generating a desirable level of thrust when ions are accelerated. 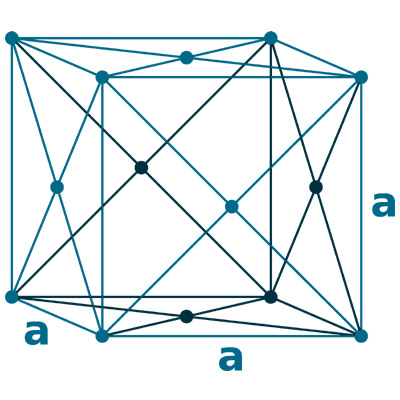 Xenon difluoride (XeF2) is used to etch silicon microprocessors. It is also used in the manufacture of 5-fluorouracil (C4H3FN2O2), a drug used to treat certain types of cancer. Biological role: It is not toxic, but its compounds are highly toxic and explosive because they are strong oxidizing agents. 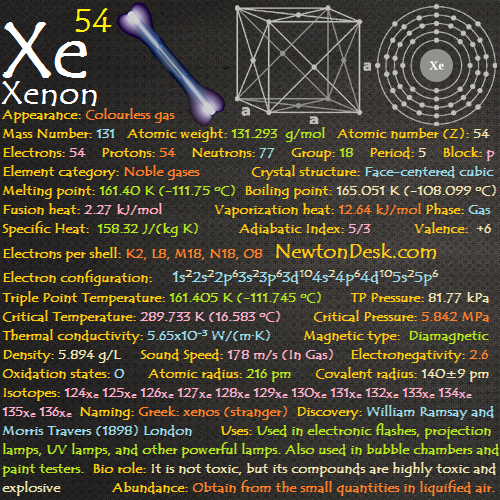 Xenon is present in the atmosphere, with only 0.086 parts per million by volume. It can also be found in some gases that created through mineral springs. 133Xe and 135Xe are radioactive Isotopes that created through neutron irradiation of fissionable material in nuclear reactors. 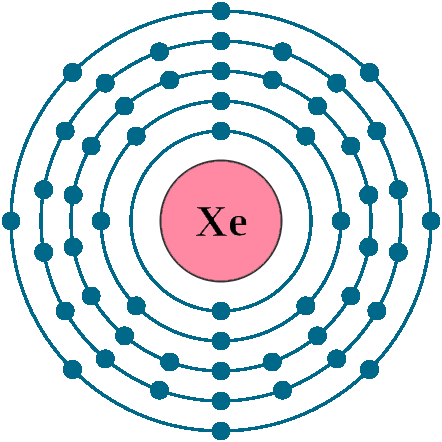 More than 80 xenon compounds have been made with xenon chemically bonded to fluorine and oxygen. Annual world wide production is around 0.6 tons.